Tonight I’m going to see Händel‘s 1743 opera Semele, which I adore, at the Brooklyn Academy of Music in a production created by La Monnaie in Brussels and the KT Wong Foundation. It’s being performed by the Canadian Opera Company in a reprisal of their performances in the 2011/2012 season, with Canadian soprano Jane Archibald resuming the title role. Looks pretty crazy, right? The key to this unusual production is the KT Wong Foundation, devoted to fostering dialogue in the arts and education between China and the West, which approached Chinese artist Zhang Huan with the idea of directing an opera. His inspiration was a 450 year old Chinese temple he bought and wound up using as the centerpiece of the production (watch it being assembled at BAM here). It’s great to see Semele performed by a smaller, regional companies, and if Zhang Huan’s production spurs renewed interest in this very deserving opera, than that’s a good thing! And for no other reason than because I like their Digital Archive, here is a set maquette from La Monnaie! The Los Angeles Philharmonic celebrated this sesquicentennial with a staged performance in collaboration with the Los Angeles Opera. 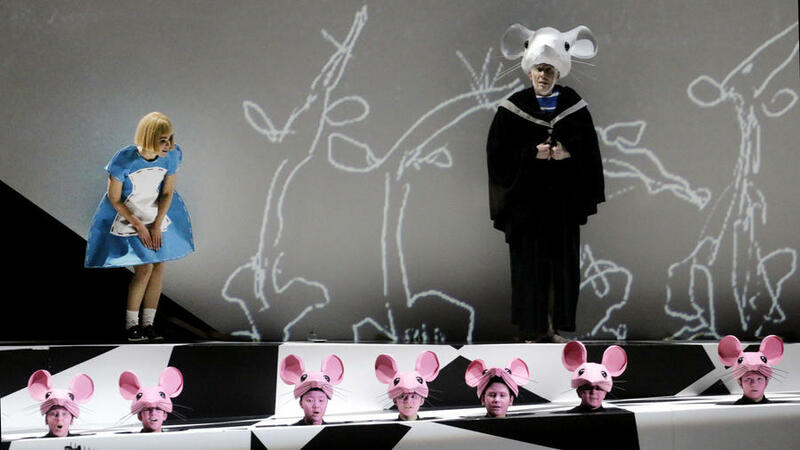 This was the work’s belated LA premiere, since the LA Opera was one of the original commissioners of the piece, which ultimately premiered at the Munich Opera Festival in 2007. The reviews I’ve read have been excellent, which is pleasantly surprising as I’ve heard mixed things about the opera with its bristly, modern musical language and elliptical, playfully obtuse libretto by David Henry Hwang. The production, by English director Netia Jones, matched that darker tone by animating illustrations from British satirist Ralph Steadman‘s 1972 edition of the book. Jones has used this technique with the LA Phil before, animating Maurice Sendak’s own Where the Wild Things Are illustrations for a performance of Oliver Knussen‘s operatic adaptation of that work. Last Monday the composer Marvin David Levy passed away and though he only ever wrote one opera, the scale of its premiere followed by its passage into obscurity and then late-life renaissance sorta overshadow all his other accomplishments… I guess opera can do that! Speaking of Met commissions, it’s apparently not an uncommon story for those rather rare birds to be neglected for a while, then championed dramatically by other companies, as the Los Angeles Opera is currently doing with John Corigliano‘s The Ghosts of Versailles, commissioned by the Met for their 100th anniversary and premiered in 1991. It would certainly be interesting to track how well Met commissions have done historically once they’ve received their house premiere, especially in light of the Met’s renewed commitment to commissioning new opera… What might they do differently going forward? At any rate, this week presents a pretty rare opportunity to see it! Here’s a Juilliard Journal article interviewing some of the people involved in this production. Which leads to some speculation… Much has been said recently about the Met showing more modern opera and even commissioning new works… In one such announcement from 2013, Argentine composer Osvaldo Golijov was said to be working on an operatic adaptation of the original Euripides play Iphigenia in Aulis, tentatively slated for the 2018/2019 Season. Hmm… Aulide, Aulis… What if – stay with me here – the Met were planning a 2018/2019 season including both Golijov and Gluck’s versions of Iphigenias in Aulis? (And hey, they could even toss in their existing production of Iphigénia en Tauride, seen below). Would that be too crazy? Or would it be super amazing? Thoughts?